The game is No-Limit Texas Hold'em, and Governor of Poker's attempt to build a story around it will make you long for a simple game of cards. As a cowboy in the Old West, you travel from tournament to tournament, playing for cash and property. Eventually, you can buy better modes of transportation to play in far-off Texas locales. Governor of Poker ($10, one-hour free trial) is a big idea that doesn't work in play. Walk around to different properties to play in poker tournaments, buy up properties, and travel to new towns in Governor of Poker. Some incorrect poker terminology makes Governor of Poker feel inauthentic and a little irksome. For example: while your first action before the flop is a "raise" due to two forced bets, after the flop, the action is a "bet". However, the button still says "raise," and the opponent's voices also announce "raise," even when they're the first ones in. They're not raising anyone. A group of hard-bitten poker veterans wouldn't make that mistake. Also, most poker veterans don't verbally declare their actions every time; often they let their chips do the talking. Finally, everyone showing their hands during a showdown, or even when one player folds, is extremely unrealistic. Most players choose not to show their hands in a tournament setting unless they're required to do so. Also, during a poker tournament, there's no way to adjust options, quit to the main menu, or even exit the app, which seems like a particularly poor bit of user interface design. These actions can only be performed once you've finished the tournament in the town view, and these options only pertain to adjusting volume and such, not fine-tuning gameplay features. If there were options available for the tournaments themselves, I'd want the ability to speed up gameplay, shut off animations or voices, automatically muck (not show) winning hands, and so on. As slow as gameplay goes in Governor of Poker, winning or placing in enough tournaments to get somewhere in the game would take hours and hours. Combining Hold'em poker with a casual strategy game is a neat idea in concept, but with Governor of Poker, Youda Games has merely wrapped the Cadillac of Poker around a casual game telephone pole. 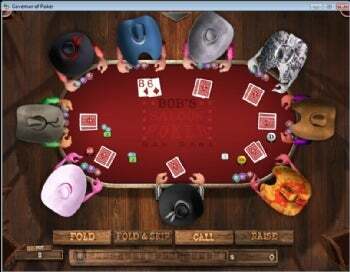 Perhaps someone will develop an amazing massively multiplayer online game with poker at its core; until then, people will just play poker instead.